My project portfolio comes in two parts: I described all my projects extensively ordered by Years, whereas the sorting by Industries shows the excerpts with links to project ids only. Select at the page bottom your preferred download format. Automotive, Aerospace / Aviation, Airlines, Air Traffic Management, Defence, Banking / Finance, Logistics, Software development, Tourism. Bosch (via Communication Team GmbH), General Motors (Opel), Visteon, Volkswagen, Thales Electron Devices GmbH, Thales Defence Deutschland, German Post Service / DHL, German Railway (DB), First­Data, Software AG, European Aeronautic Defence and Space Company (EADS), Start Amadeus, German Air Navigation Service Provider (DFS), T-Systems Multimedia Solutions GmbH, Matrix42, Daimler AG, Magna Transmission Systems (former Getrag). Since 2018 Trainer at Die Akademie für Führungskräfte, Überlingen, Germany for Agile, and Design Thinking and Innovation Management. 2016 trainer at Humbold Univ., Hannover, for the Lego Serious Play methode. Studies of Physics, Philosophy, Linguistics, and German Literature (Academic degree: Magister Artium, 1988). five years as a research fellow at Univ. Hamburg, Stuttgart, and Mainz (field: Computational Linguistics). Research fellow at IBM Center for Knowledge Based Systems, Stuttgart. Nine years industry experience as developer and project manager in the area of Air Traffic Management systems (ATC systems airport Karthoum/Sudan, Augsburg/Germany). Since 1999 consultant in: project mgt, quality mgt/assurance, requirement mgt, and software process improvement (CMMI, ISO 15504, Automotive SPiCE). Freelancer since 2010: Scrum master and Agile Coach, organisational Change Agent/Transformator. Addicted to gamified facilitation techniques: agile games, certified Innpovation Games and LEGO Serious Play facilitator. Speaker on international conferences and open space events. An international automotive supplier, market leader in gears and transmission development, asked for support to improve the SW development processes and project collaboration regarding to Lean and Agile aspects. After an analysis the mandate became clear: working as executive coach with the upper and middle management of SW department (coaching 12 managers); coaching on team level 4 devteams (up to 20 employees). I introduced agile thinking and values (Scrum, Kanban), system thinking, and design thinking into the SW department. I facilitated value stream workshops on department level. We started 2 new teams as cross-functional feature teams (my role was coaching team members and product owners). In 2018 we started an improvement initiative as a contiuously running lean change management program on SW department level (approx. 260 people). My role was being a sparrings partner for the management to discuss the transition activities and to facilitate all workshops. Abstract: Reading Time: 2 minutes My mandate was to support a PO team to achieve better personal acknowledgement and to foster their internal collaboration. Description: An IT service provider delivers solutions to distribute SW applications on different technical platforms (Windows, Linux, Android, iOS). The company is on the agile transition journey since 1,5 years. We don't want to unveil historic quarrels the 1000-th time again and again. We concentrate on building the future right now, instead. 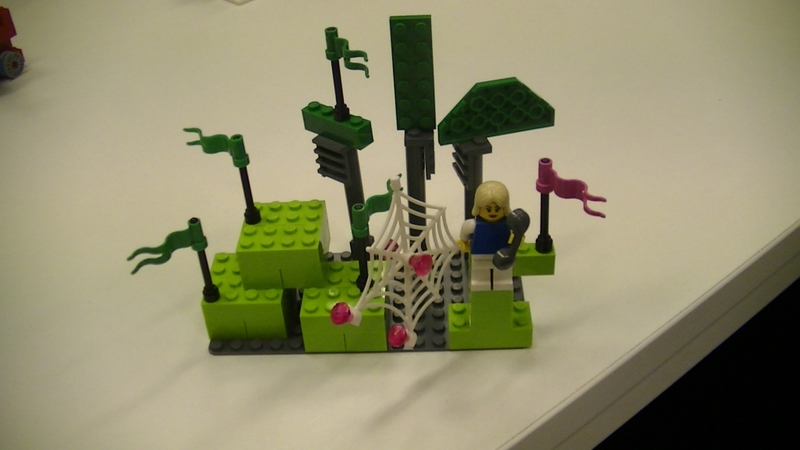 Thus, I split the assignment into two parts: (1) personal appreciation and motivating, and (2) solution-focused exercises with LEGO Serious Play to identify the next steps. To open communication and to get insights on personal motivation we did the Super-Hero exercise: each PO introduced herself metaphorically as a super hero figure and reflects the colleagues as super heroes. This part on the personal motives and engagement was closed with the Management 3.0 Moving Motivators exercise. In four levels, we identified solution criteria and the steps needed to achieve them. These levels were divided to individual and group reflections. Then each participant used her model to shared her individual insights and thoughts with the group metaphorically. „Agree on as many common characteristics of the optimal future you see in the models. Then each participant used her model to shared her individual commitments with the group metaphorically. I had planned to close the workshop by each participant identifying the support needed to achieve her goals and getting the promise of one or more of the group for help. However, the participants detoured in discussing the old quarrels. Since they toke in account the new insights of the workshop this a valuable closing as well. Abstract: Reading Time: 1 minute “The Drama Game” is a Story Telling Game to identify stakeholders behaviours and hidden expectations. Playing the game in retrospectives creates a shared understandings of events and incidents happened in the Product Development Life Cycle. The Drama Game is a storytelling game to identify stakeholders behaviours and hidden expectations. With the feedback, I got from presenting the game in multiple conferences and open-space sessions, I created a new version of the game by simplifying the storytelling part and the empathy reading. 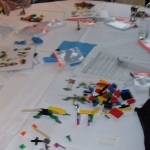 Abstract: Reading Time: 2 minutes Facilitating a team building workshop with Agile Games and LEGO Serious Play. An agile software company wanted to identify and bolster up the internal power of the devteam members again: "Identify your team power & your power team"
Description: An agile software company asked to identify and bolster up the internal power of the devteam members again: "Identify your team power & your power team". Check-In: game to welcome and to attune participants to the workshop. Plus-Minus-Delta: a well-known retrospective tool to identify what is going well and what needs to be changed. Super Hero: game to raise awareness of participants for already known and as well hidden own powers / competencies, the divergence between self-perception and public image, and team member’s diversity of strengths. To get aware of the self-perception of already known or hidden own powers and competencies. To realise and accept that there often is a difference between self-perception and public image: how I recognise myself vs. how others recognise me. To become aware of the other team member’s diversity of strengths. 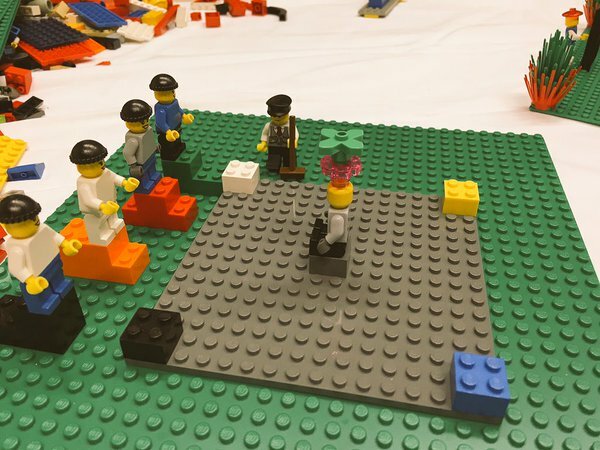 The Lego Serious Play was set up and ran at different levels of abstractions to gain specific insights and individual commitments. The goal of this LSP game was to share individual and personal insights regarding to the question posed in the group. Each builder images and constructs an individual model for herself to answer the question raised by the facilitator. After building, each builder explained her model. The goal of this game was to create a shared understanding and consensus of the topic in question. The group consolidates all individual models in a common shared model agreed by all. After building the shared model, the participants identified break points, interfaces, and connections in the model. The goal of this activity was to simulate the consequences of decisions by playing scenarios. The participants explored how the models or the landscape responded to dynamic changes / events. Therefore, after building the shared model, the participants identified break points, interfaces, and connections in the model. 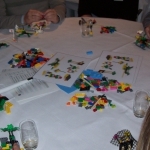 Abstract: Reading Time: 2 minutes Facilitating a LEGO Serious Play workshop: international sales directors of an automotive supplier came together with upper management to discuss how to achieve new business goals for 2014/2015. 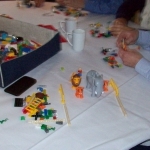 After a warm-up exercise fiddling with the LEGO bricks the participants ran the Lego Serious Play method on two levels of abstraction: individual and organisational level. 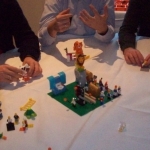 The participants on each table were asked to built a personal model of their most important professional milestones (either at the current company or a previous one). At each table all participants shared their stories by explaining their models built. 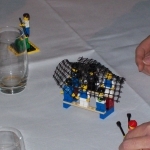 The participants on each table were asked to built a model of a realistic future perspective from their personal view. At each table all participants shared their stories by explaining their models built. 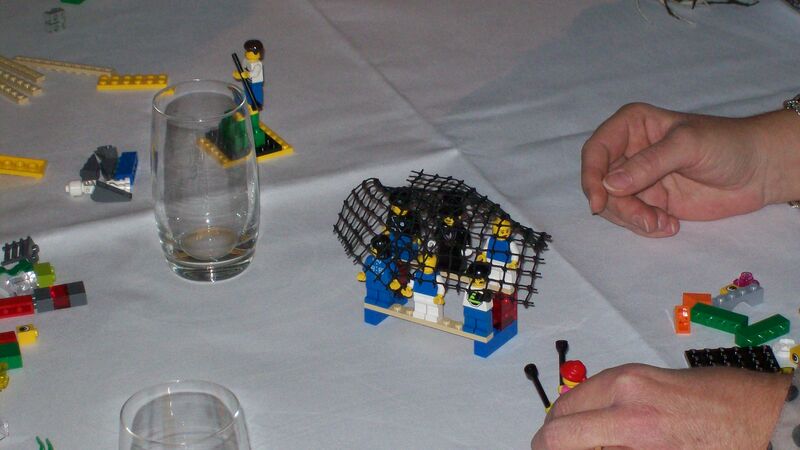 The participants on each table were asked to built a combined model of all views shared on the table. The participants on each table were mixed arbitrarily — national or department overlaps were by random only. For each table a transcript writer was selected and each group came together with a common shared meaning of the model built. We closed the Lego Serious Play workshop with the potentials identified at each table how to achieve the business goals. With this information the participants and upper management started a new workshop session to identify steps needed for implementation. : dinosaur shots, via flickr.com, . Abstract: Reading Time: 1 minute Temenos is an experience based workshop format for people interested in personal growth, strength, and authentic relationship with others. At the Jax2014 conference Olaf Lewitz and Christine Neidhardt ran a Temenos workshop with 275 ppl. supported by several co-facilitators. Temenos is an experience based workshop format for people interested in personal growth, strength, and authentic relationship with others. Temenos invites us to experience connection, openness and trust on a level that’s not accessible to us in daily life. With Temenos, we can safely test more effective methods of relating with others. At the Jax2014 conference Olaf Lewitz and Christine Neidhardt ran a Temenos workshop with 275 ppls. supported by several co-facilitators. I was one of them. : Zach Dischner, via flickr.com, . Description: Engage your customers as being a character of your Product Development Hero Quest! – “The Drama Game” is a Story Telling Game to identify stakeholders behaviours and hidden expectations. Playing the game in retrospectives creates a shared understandings of events and incidents happened in the Product Development Life Cycle. 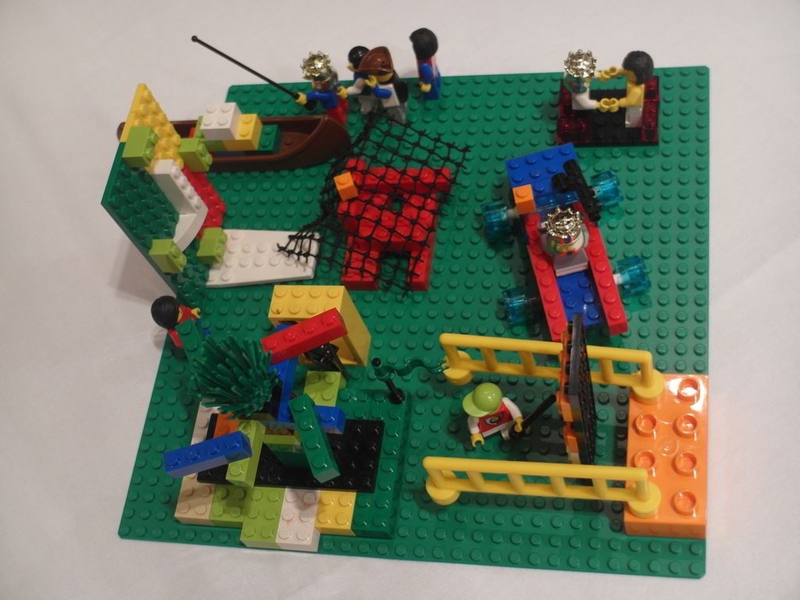 Abstract: Reading Time: 1 minute “Product Owner Challenge” is a agile game with Lego bricks. It supports organisations in transitioning from Waterfall to Agile and illustrates the agile mindset to a waterfall-driven product development culture: stop micro-management and communicate face-to-face clear objectives, requirements, and product vision. 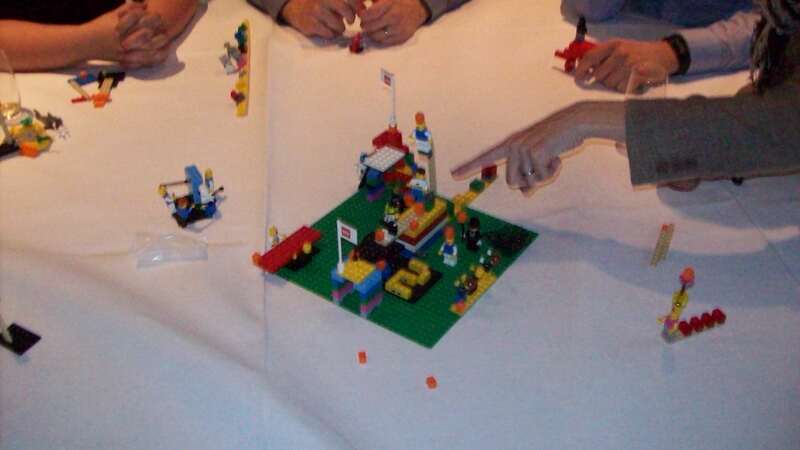 Description: “Product Owner Challenge” is an agile game with Lego bricks. It supports organisations in transitioning from Waterfall to Agile and illustrates the agile mindset to a waterfall-driven product development culture: stop micro-management and communicate face-to-face clear objectives, requirements, and product vision. The product description is in one part of the room, PO and DevTeam in the other. PO is not allowed to show it to DevTeam, but can inspect the plan as often it's needed — PO has to "walk & talk" – real challenges for traditional-minded product development departments. Abstract: Reading Time: 1 minute An international Germany-based telecommuncation company asked to foster the togetherness of the devteam. 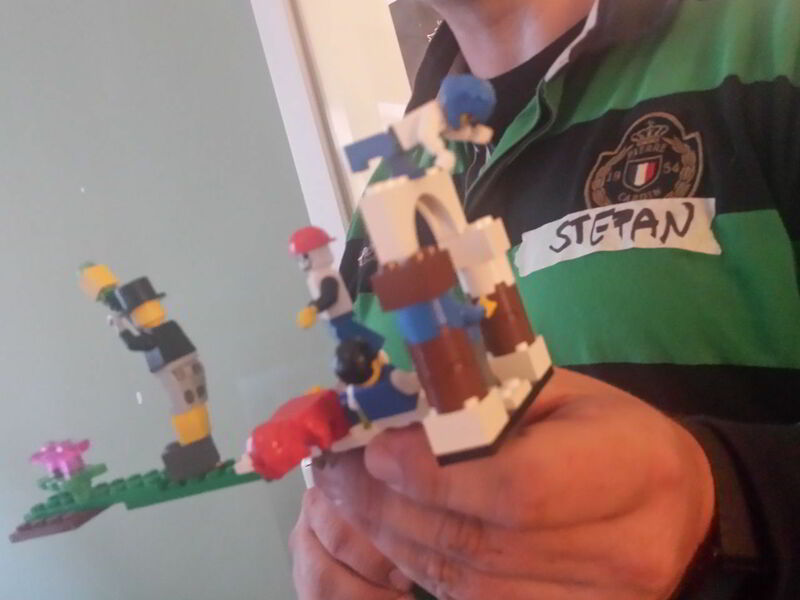 In a LEGO Serious Play workshop the participants identified each others individual goals and desires. From this next-steps were identified needed to implement the next day on the workplace all insights. Description: An international Germany-based telecommuncation company asked to foster the togetherness of a devteam. In the workshop the participants identified each others individual goals and desires. From this, they derived their individual motivations to collaborate within the group. The participants agreed on common acceptable regulations within the team and next-steps needed to implement the next day on the workplace all insights. Project size: Agile customer devteam (4 participants). Abstract: Reading Time: 1 minute Re-Engineering of functional requirements, test scenarios and test cases for a video camera driver assistant system. Description: An international automotive supplier builds a video camera driver assistant system. Within the last years new functionality was added to the overall system to satisfy the needs of different OEMs. The OEMs dev team developed the software with the agile Scrum framework. Over the years the documentation (requirements, architecture and implementation, test cases) became obsolete.An external company was asked to setup a team of embedded system developers and testers to analyse the code (C++) and to redesign functional requirements, test scenarios and test cases. This team was also setup as a Scrum team.My role was twofold: 1) as Scrum Master I defined with my team the weekly deliveries (analysis results) for the OEM; 2) agile coach for the team; and 3) for the direct contractor and the OEM I was the contact to the team. : Steve Jurvetson, via flickr.com, . Role: CMMI Dev. 1.2 consultancy; contact person on department and executive level for CMMI improvement activities. Abstract: Reading Time: 1 minute A high-innovative R&D project of an european Avionics and Space Company was faced to improve some of their product development processes: Req. Engineering, Project Mgmt, and Quality Mgmt to CMMI Dev.1.2 Level 2. Since the project developed an ionic beam thruster device for the ESA Gallieo Satellite Program, the challenge was to fulfil the objectives of the European Space Agency Standard (ECSS) on the one side and the corporate objectives CMMI L2 on the other side. Description: The german R&D facility of a european Avionics and Space Company developed for the ESA Galileo Satellite Program the satellite ionic beam thruster. on customer level (ESA) the embedded system development had to be compliant with the international certification standards (ECSS) for embedded system space readiness. to coach and train the team members in these activities. : NOAA Photo Library via Flickr.com, . Role: Conceptual design and realisation of the training (english): content, slides, methods. Abstract: Reading Time: 1 minute For the maritime business branch I developed a customer training to illustrate benefits and application of CMMI process areas in developing programmable electronic systems (PES) in building ships. Description: For the maritime business branch I developed a customer training to illustrate benefits and application of CMMI in the development of programmable electronic systems (PES) for maritime purposes. The training covered the description of CMMI process areas and principles, quality and cost benefits of using CMMI in shipyards and ship constructions. Lateron I was trainer/speaker in the trainings. : Rennett Stowe, via flickr.com, . Abstract: Reading Time: 1 minute ISO 15504 Automotive SPiCE co-assessor in an automotive supplier ASPiCE L2 assessment. Assessed were the development processes (extended HIS standard) of developement facilities in Germany, UK, and India. Description: Selected projects of an automotive supplier (car lightning systems) were assessed in an external iNTACS-complainte Automotive SPiCE Level 2 assessment. Assessed were the development processes (extended HIS standard) of developement facilities in Germany, UK, and India. Size: 10 assessment team members (supplied by the customer), interview partners at developement centers in UK and India. : Naval Surface Warfare Center, via flickr.com, . Abstract: Reading Time: 1 minute Design and development of configurations management trainings for the rollout of CMMI Dev. 1.2 Level 2 compliant CM processes. Description: The configuration management processes of all european software development facilities had to be standardised according to CMMI Dev. 1.2 CM Level 2. My task was to design and develop the CM trainings classes for the rollout. : Joshua Davis, via flickr.com, . Size: 50 ppl. (Process Improvement Group & development projects). : Virginia Guard Public Affairs, via flickr.com, . Abstract: Reading Time: 1 minute Establishing the new business field Organisational Change Management (OCM); setup skill competencies, internal and external trainings, and collection of methods and tools. Description: To establish the new business field Organisational Change Management (OCM) I was as national contact person and subject matter expert in charge to develop skill competencies, internal and external trainings, and to set up a consultancy collection of methods and tools. : Chris Fithall, via flickr.com, . Abstract: Reading Time: 1 minute Inspection of the requirements engineering and management processes of an automotive supplier for potential improvements. Identifying recommendations for improvements on artefacts level ( tracebility within documents/DOORS db) and further potential improvements on process level. Description: An international automotive supplier asked to inspect the systems requirements engineering and management processes of their climate control systems development branch.Objects under inspection were: requirements and design documentation, DOORS database, and working procedures, resp. process descriptions. CMMI Dev.1.2 (REQM, RD), level 2, was chosen as reference model. Primary goals were to identify recommendations improvements on artefacts level (tracebility within documents/DOORS db) and further potential improvements on process and workplace level. The final management presentation showed minor improvements on artefact level and major improvement possibilities in adopting Scrum as new development framework. : Patrick Herbert, via flickr.com, . Abstract: Reading Time: 1 minute Conceptual design (content, slides, methods) and realisation of a 3 day training (english) „ISO 15504 for System Engineers“. Description: Conceptual design (content, slides, methods) and realisation of a 3 day training (english) „ISO 15504 for System Engineers“. The training presents ISO 15504 Process Reference Model (PRM), Process Assessment Model (PAM) in details for system engineers (HW/SW embedded systems development). : U.S. Army Corps of Engineers Europe District, via flickr.com, . Abstract: Reading Time: 1 minute Conceptual design (content, slides, methods) and realisation of a 3 day training (english) „ISO 15504 for Managers“. Description: Conceptual design (content, slides, methods) and realisation of a 1 day training (english) „ISO 15504 for Managers“. The training presents ISO 15504 Process Reference Model (PRM), Process Assessment Model (PAM) and cost/benefits ratio in details for C-level managers. Abstract: Reading Time: 1 minute Conceptual design (content, slides, methods) and realisation of a 3 day training (english) „Automotive SPICE® for System Engineers“. Description: Conceptual design (content, slides, methods) and realisation of a 3 day training (english) „Automotive SPICE® for System Engineers“. The training presents Automotive SPICE® Process Reference Model (PRM), Process Assessment Model (PAM) in details for system engineers (HW/SW embedded systems development). Abstract: Reading Time: 1 minute Conceptual design (content, slides, methods) and realisation of a 3 day training (english) „Automotive SPICE® for Managers“. Description: Conceptual design (content, slides, methods) and realisation of a 1 day training (english) „Automotive SPICE® for Managers“. The training presents Automotive SPICE® Process Reference Model (PRM), Process Assessment Model (PAM) and cost/benefits ratio in details for C-level managers. Role: CMMI Dev 1.2 consultancy; team lead and subject matter expert for process groups REQM, RD. Abstract: Reading Time: 1 minute Improving Electronics & Embedded Systems Development on Corporate Level (CMMI REQM Level 2) for an US-based automotive OEM. Description: An US-based automotive OEM started to optimise the embedded systems development processes on corporate level to CMMI Dev. 1.2 Level 2. Pilot projects were chosen to test and optimise improvements and to coach employees. I was in charge as team lead and subject matter expert for process groups REQM, RD in international development centers Germany, Sweden, US. Size: 100 ppl: OEM, supplier and sub-contractors. : Hans Mestrum, via flickr.com, . Abstract: Reading Time: 1 minute The Germany located IT department of an international Postal and Logistics Service Provider was challenged to pass a CMMI Dev. 1.2 Level 2 appraisal. At the same time the overall IT maintenance and operation processes run according to ITIL 2.0 with quarterly planned release and update cycles. Role: CMMI Dev. 1.2 consultancy; contact person on department and executive level for CMMI improvement activities, and team lead of the external consultants. Description: The Germany located IT department of an international Postal and Logistics Service Provider was challenged to pass a CMMI Dev. 1.2 Level 2 appraisal. At the same time the overall IT maintenance and operation processes run according to ITIL 2.0 with quarterly planned release and update cycles.For the department responsible to manage and distribute all IT system changes to all agency bureaus and offices national-wide, my appointment was together with some colleges to leverage the requirements engineering processes to REQM/RD. There was a kind of cultural clash. On department level the requirements managing team worked in the past like order managers. They accepted or rejected change orders from the several business divisions, prioritised them and assigned the to existing IT systems. Then the change order were passed to the IT developer teams. In CMMI requirements engineering & managing processes accompanies the complete development/change project. They start with requirement gathering and elicitation at the beginning and passes then to design, implementation, and validation/verification criteria. After a CMMI REQM/RD training and several discussions the requirements managing team member were motivated to work in the new way. and internal contacts to the corporate improvement program and upper management. : Deutsche Post DHL, via flickr.com, . Abstract: Reading Time: 1 minute Conceptual design and realisation of "Certified Tester Foundation Level" training course (english): content, slides, methods. Content according to iNTACS training syllabus. Description: Conceptual design and realisation of the training (english): content, slides, methods. Content according to iNTACS training syllabus. : Lachlan Hardy, via flickr.com, . Role: ISO 15504 process improvement consultancy; contact to upper management and corporate-level quality assurance department; coaching of project team members and PM. Abstract: Reading Time: 2 minutes Leveraging a development project for a steering driver assistance system to ISO 15504 (SPiCE) Level 2. An international Germany-based automotive OEM decided according to corporate guidelines and IT-goverance regulations to take all corporate-belonging component development plants as "suppliers". To assure a high product quality the corporate quality assurance department asked the corporate-belonging facility developing a steering driver assistance system to improve their SW- and HW development processes in respect to achieve ISO 15504 (SPiCE) Level 2 within a year. At the begining there did not exist any distinctive SW development processes. Even though, the process maturity had to be leveraged to level 2. The process model to be implemented had to incorporate at the same time SW- and HW-development processes satisfying ISO 15504 Level 2 objectives. In detail: Project Management & Control, Quality Management & Assurance, Configuration Management, Requirements Management, SW Design/Implementation, Testing. According to corporate guidelines all external suppliers and sub-contractors of the project had to be leveraged to SPiCE Level 1 at the same time. A process model with iterations, identified phases and synchronisation points/gateways to support SW and HW development activities running in paralell. A light-weight, flexible project internal change control process to estimate change efforts and to accept/reject change requests. Tool-supported (Telelogic CM Synergy) configuration management for SW and HW development. Automatic code generation from Mathlab-Simulink models to C code. A light-weight review process with quality gates, acceptance criteria, and check lists to assure project internal quality for all project artefacts: documents, MathLab-Simulink models, and generated C code. Size: 100 ppls: project, supplier, sub-contractors, and OEM corporate. : Phil Desveaux via Flickr.com, . Abstract: Reading Time: 1 minute Authoring a marketing portal user help files for large german airline. Description: Authoring a marketing portal user help files for large german airline. The portal was used for communication and interaction with associated advertising agencies. : Vyacheslav Argenberg, via flickr.com, . Abstract: Reading Time: 1 minute Supporting the IT development projects in the business area of Railway Ticketing Marketing System with operational QM/QA activities and evaluation in respect to possible improvements. Description: For an international logistics and railway company I supported the IT development projects in the business area of Railway Ticketing Marketing System. I supported the projects with operational QM/QA activities and evaluated them in respect to possible improvements. : Daniel Schuhmann, via flickr.com, . Abstract: Reading Time: 1 minute Supporting the IT development projects in the business area of call center/fulfillment with operational QM/QA activities and evaluation in respect to possible improvements. Description: For an international logistics and railway company I supported the IT development projects in the business area of call center/fulfillment. I supported the projects with operational QM/QA activities and evaluated them in respect to possible improvements. : Alan Clark, via flickr.com, . Abstract: Reading Time: 1 minute For an international logistics and railway company I developed a concept and evaluation scheme for a QM Handbook Intranet-Portal Solution. Description: For an international touristics company I supported the IT department in a developed a concept and evaluation scheme for a QM Handbook Intranet-Portal Solution. Evaluation of market available task monitoring tools. : Jason Rogers, via flickr.com, . Description: For an international touristics company I supported the IT department in developing a concept and evaluation scheme for a QM Handbook Intranet-Portal Solution. : tec_estromberg, via flickr.com, . Abstract: Reading Time: 1 minute Defining the operational structure and establishing a staff unit "Quality Assurance" on CIO level to start quality management and monitoring activities in all IT projects (in-house and outsourced ones). Description: The CIO Passenger Traffic of an international logistics and railway company wanted to support and improve the effectives of the IT projects and services running as well in-house and the outsourced one. Together with a colleague I established a staff unit "Quality Assurance" on CIO level to start quality management and monitoring activities in all IT projects (in-house and outsourced ones). we designed tools: templates, quality criteria, and checklists to be used in the projects. : Gerard-Nicolas Mannes, via flickr.com, . Abstract: Reading Time: 1 minute For a reinsurance company I assessmed six internal IT systems/projects regarding process strengths, weaknesses, and opportunities. Description: For a reinsurance company I assessmed six internal IT systems/projects regarding process strengths, weaknesses, and opportunities. : Damian Morys, via flickr.com, . Abstract: Reading Time: 1 minute Supporting the IT system "PIN Authorisation System" with operational QM/QA activities. Description: In consequence of Y2K issue a credit card issuer established a staff unit "Quality Assurance" on corporate level. I supported the IT system "PIN Authorisation System" of a credit card issuer with operational QM/QA activities. : Kev, via flickr.com, . Abstract: Reading Time: 1 minute Supporting the IT system "SAP Data Warehouse" with operational QM/QA activities. I supported the IT system "SAP Data Warehouse" of a credit card issuer with operational QM/QA activities. : Kim Scarborough, via flickr.com, . Abstract: Reading Time: 1 minute Supporting the IT system "Acquirer Payment Gateway" with operational QM/QA activities. I supported the IT system "Acquirer Payment Gateway" of a credit card issuer with operational QM/QA activities. : Tristan Schmurr, via flickr.com, . Abstract: Reading Time: 1 minute Defining the operational structure and establishing a staff unit "Quality Assurance" on corporate level to start quality management and monitoring activities in all IT projects. The objectives were to ensure Y2K readiness and assess Y2K effectivness in the first run and to support IT changes and development in the future in all quality managemenet issues. : Sean MacEntee, via flickr.com, . My mandate was to support a PO team to achieve better personal acknowledgement and to foster their internal collaboration. 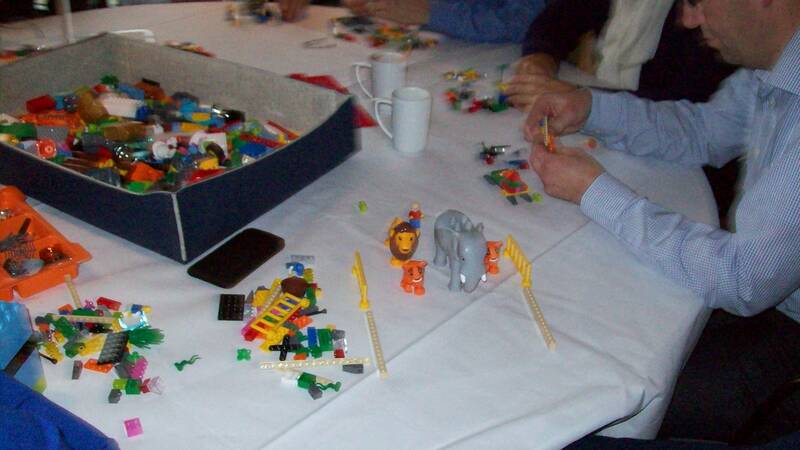 Facilitating a team building workshop with Agile Games and LEGO Serious Play. An agile software company wanted to identify and bolster up the internal power of the devteam members again: "Identify your team power & your power team"
Implementing a DO-178B, DO-178C/ED-12C compliant software development process model for air traffic management systems developer. Moderating, and documenting safety workshops. An international Germany-based telecommuncation company asked to foster the togetherness of the devteam. In a LEGO Serious Play workshop the participants identified each others individual goals and desires. From this next-steps were identified needed to implement the next day on the workplace all insights. Inspection of the requirements engineering and management processes of an automotive supplier for potential improvements. Identifying recommendations for improvements on artefacts level ( tracebility within documents/DOORS db) and further potential improvements on process level. 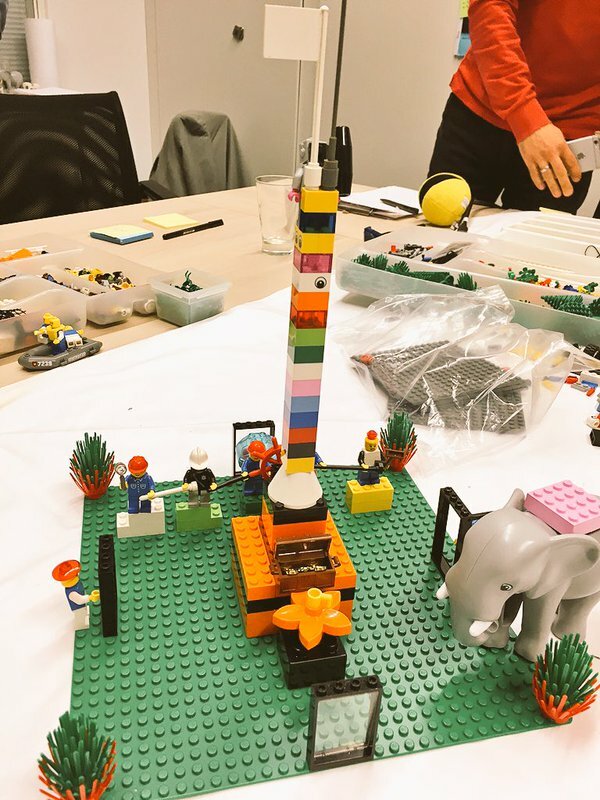 Faciliating a LEGO Serious Play Workshop "IT Goverance & PMI certification" — Create commitment of 70 project managers to adopt the new organsiational PMI certification program; define next steps to support the implementational program rollout. A high-innovative R&D project of an european Avionics and Space Company was faced to improve some of their product development processes: Req. Engineering, Project Mgmt, and Quality Mgmt to CMMI Dev.1.2 Level 2. Since the project developed an ionic beam thruster device for the ESA Gallieo Satellite Program, the challenge was to fulfil the objectives of the European Space Agency Standard (ECSS) on the one side and the corporate objectives CMMI L2 on the other side. Design and development of configurations management trainings for the rollout of CMMI Dev. 1.2 Level 2 compliant CM processes. Authoring a marketing portal user help files for large german airline. 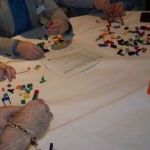 Project ID: 8803 Agile Coaching Tools Development: Agile Game “Product Owner Challenge 2.0"
"Product Owner Challenge" is an agile game played with Lego bricks to demonstrate a waterfall-driven product development the agile mindset. Project ID: 8807 Agile Coaching Tools Development: "Team Charter Canvas"
The team charter canvas is a perfect tool to reflect in more depth about team values, norms, chartering, and team culture. Project ID: 8785 Agile Coaching Tools Development: Agile Game “The Drama Game 2.0"
“The Drama Game” is a Story Telling Game to identify stakeholders behaviours and hidden expectations. Playing the game in retrospectives creates a shared understandings of events and incidents happened in the Product Development Life Cycle. 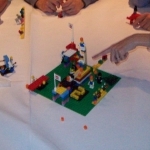 Project ID: 1547 Agile Coaching Tools Development: Agile Game “The Drama Game"
Project ID: 1549 Agile Coaching Tools Development: Agile Game “Product Owner Challenge"
“Product Owner Challenge” is a agile game with Lego bricks. It supports organisations in transitioning from Waterfall to Agile and illustrates the agile mindset to a waterfall-driven product development culture: stop micro-management and communicate face-to-face clear objectives, requirements, and product vision. Facilitating a large group EGO Serious Play workshop: management, team and project leader of the Afte Sales Depart. of a hugh german automotive OEM came together to envision and discuss future trends in "2021". 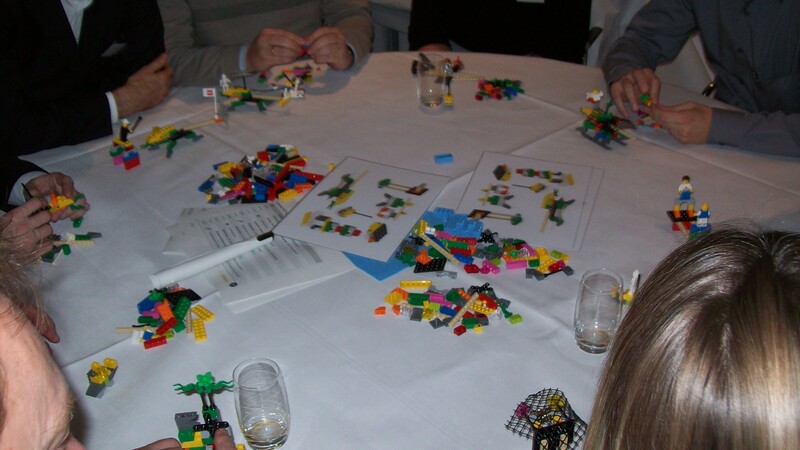 A visioning and brand building workshop with LEGO. Levering Automotive Suppliers QA Processes to Automotive SPICE Level 2. 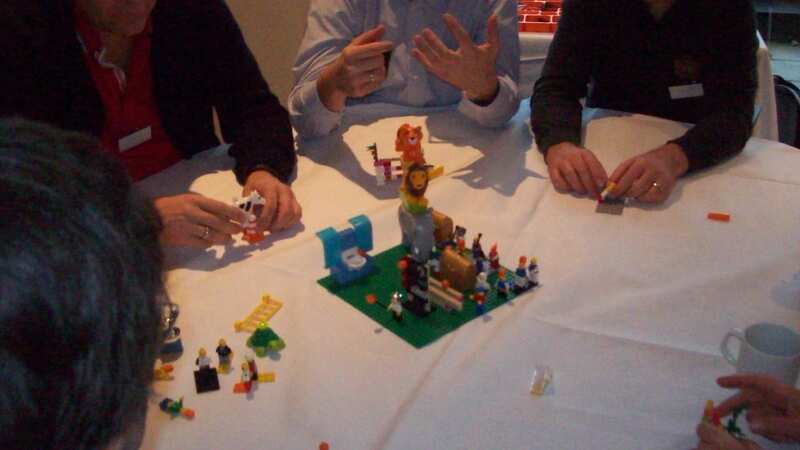 Facilitating a LEGO Serious Play workshop: international sales directors of an automotive supplier came together with upper management to discuss how to achieve new business goals for 2014/2015. Re-Engineering of functional requirements, test scenarios and test cases for a video camera driver assistant system. ISO 15504 Automotive SPiCE co-assessor in an automotive supplier ASPiCE L2 assessment. Assessed were the development processes (extended HIS standard) of developement facilities in Germany, UK, and India. Conceptual design (content, slides, methods) and realisation of a 3 day training (english) „Automotive SPICE® for System Engineers“. Conceptual design (content, slides, methods) and realisation of a 3 day training (english) „Automotive SPICE® for Managers“. Improving Electronics & Embedded Systems Development on Corporate Level (CMMI REQM Level 2) for an US-based automotive OEM. Leveraging a development project for a steering driver assistance system to ISO 15504 (SPiCE) Level 2. Temenos is an experience based workshop format for people interested in personal growth, strength, and authentic relationship with others. At the Jax2014 conference Olaf Lewitz and Christine Neidhardt ran a Temenos workshop with 275 ppl. supported by several co-facilitators. Supporting the IT system "PIN Authorisation System" with operational QM/QA activities. Supporting the IT system "SAP Data Warehouse" with operational QM/QA activities. Supporting the IT system "Acquirer Payment Gateway" with operational QM/QA activities. Defining the operational structure and establishing a staff unit "Quality Assurance" on corporate level to start quality management and monitoring activities in all IT projects. For a reinsurance company I assessmed six internal IT systems/projects regarding process strengths, weaknesses, and opportunities. For the maritime business branch I developed a customer training to illustrate benefits and application of CMMI process areas in developing programmable electronic systems (PES) in building ships. Establishing the new business field Organisational Change Management (OCM); setup skill competencies, internal and external trainings, and collection of methods and tools. For an international logistics and railway company I developed a concept and evaluation scheme for a QM Handbook Intranet-Portal Solution. 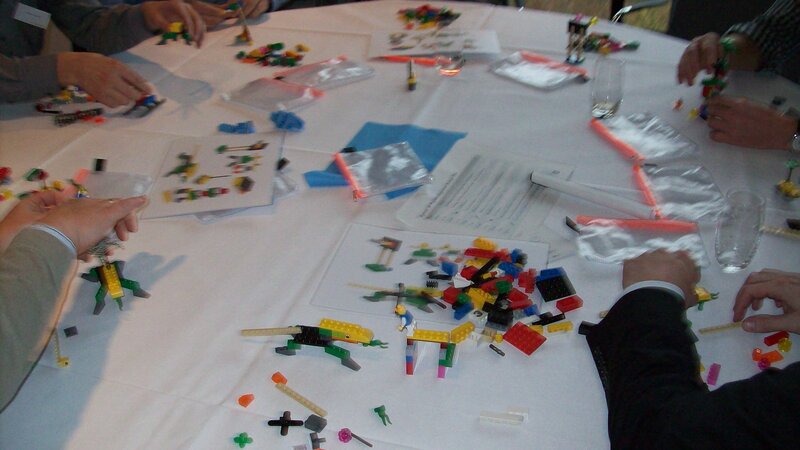 Facilitating a LEGO Serious Play Workshop: Consumer Health Regulary Affairs (Pharma). After merging the independent national regulation affairs departments to one global department, the challenge for the employes was to identify new ways of collaboration and to define steps necessary to set up this new mindset. The Germany located IT department of an international Postal and Logistics Service Provider was challenged to pass a CMMI Dev. 1.2 Level 2 appraisal. At the same time the overall IT maintenance and operation processes run according to ITIL 2.0 with quarterly planned release and update cycles. Supporting the IT development projects in the business area of Railway Ticketing Marketing System with operational QM/QA activities and evaluation in respect to possible improvements. Supporting the IT development projects in the business area of routeing with operational QM/QA activities and evaluation in respect to possible improvements. Supporting the IT development projects in the business area of call center/fulfillment with operational QM/QA activities and evaluation in respect to possible improvements. Defining the operational structure and establishing a staff unit "Quality Assurance" on CIO level to start quality management and monitoring activities in all IT projects (in-house and outsourced ones). Conceptual design (content, slides, methods) and realisation of a 3 day training (english) „ISO 15504 for System Engineers“. Conceptual design (content, slides, methods) and realisation of a 3 day training (english) „ISO 15504 for Managers“. Project ID: 2031 Training Development: "Certified Tester Foundation Level"
Conceptual design and realisation of "Certified Tester Foundation Level" training course (english): content, slides, methods. Content according to iNTACS training syllabus. Happy Salmon played at Play4Agile 2018, Germany, #p4a18. 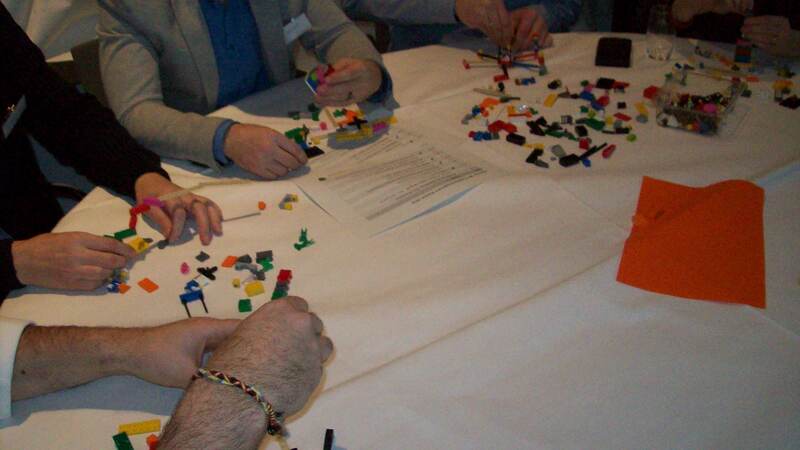 LEGO Serious Play - Strategic Decision Making & Problem Resolution with Fun! Lesung "Erotische Lyrik aus fünf Jahrhunderten"